Luxury 3 bedroom 2 bath condo,located in Kissimmee, Florida is approx. 5-10 min from maingate Disney Theme Parks and Disney Springs. It has A/C, washer/dryer, full kitchen, Keric Coffee Maker, 32 and 40 inch cable flat screen TVs, Blu-Ray DVD, wireless Internet, and plenty of space. There is a recreational house, pool, jacuzzi, dry sauna, internet access, game room, BBQ area and a fitness room all within the resort. There are refreshments and food available near the pool area. Just outside the resort, there are many fine dining establishments within a short walk or drive. The Universal Studios / Islands of Adventure theme park, The new Wizarding World of Harry Potter, The New LegoLand theme park in Winter Haven, along with CityWalk, Seaworld, Olde Town and the Kennedy Space Center are all within a short driving distance. There are many beaches like Cocoa, Daytona, Melbourne, New Smyna, and Clearwater are within a short drive. There is also the Seminole / Hard Rock Hotel and Casino located for your enjoyment available in Tampa, FL., which is only a one hour drive on Route 4 (West) off Hillsborough Ave Exit and Orient Road. The casino provides gaming activities such as Bingo, Baccarat, Poker, Slots, Craps and Blackjack. There are also many restaurants and sports entertainment venues available..ESPN Sports Complex...Amway Center...Kissimmee Sports Complex....for your enjoyment. 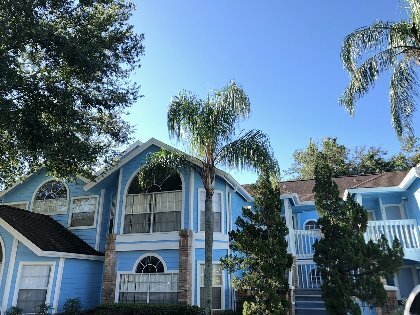 There is a pool, jacuzzi, wireless internet, Washer/Dryer, 32 and 40 inch flat screen tvs, Bluray DVD Player, workout/fitness room, game room and sauna for your use within the resort area. It is a short drive to DisneyWorld, Disney Springs, Universal Studios, CityWalk, Islands of Adventure, Wizarding World of Harry Potter, SeaWorld, Discovery Cove, International Drive, Kennedy Space Center and the New LegoLand theme park in Winter Haven....In addition there is the Seminole Hard Rock Cafe Hotel and Casino for your nightly enjoyment, located off of West I-4 (Tampa)..North Orient Rd. The casino games available are Baccarat, Poker, Slots and BlackJack, along with fine dining and entertainment. Livingroom photo 1 has a 37 inch TV, and Wireless Internet. has a Queen size Bed, and a 32 inch Flat screen TV. Full Kitchen has a dishwaher, refrigerator with ice maker,microwave and electric stove. There is a $250 (US) deposit required via credit card. The deposit is part of your total and not in addition too. A 13% state/local tax is levied to your total due. If your stay is 6 nights or less the rate is $95 per night plus 13% tax. If your stay is for 7 nights or more the rate is $89 per night plus 13% tax. There is a cleaning fee of $85 added to all reservations.If you have a pet, there is a $85 charge added. If you stay for a one month period or longer...there is a $350 deposit required via Credit Card. Deposit: There is a $250 (US) initial deposit via Credit Card. This deposit is part of your total due. The initial deposit via Credit Card for Monthly rentals is $350. Cancellations and Refunds: If cancellation is at least 30 days before arrival then there is a 100% refund. Within 30 days of arrival, there is a 50% refund on the deposit. Other Fees: !! PET RULES AND FEE: !! There is a one pet (10 pound) weight limit allowed to stay with the party within the condo. The party is required to clean up all of the pets business while within the resort area. There is a $85 plus tax pet fee.